The typical honey bee (female forager) will visit 100 flowers in an hour’s time before returning to the hive to drop off collected pollen. The bee will repeat this process about ten times in a day. I like to say the honey bee travels at a speed of 100 FPH, even though it beats it wings around 12,000 times per minute. One of our own took a few stings to the face last night. It seems instinctual for bees to go for the face. If you’ve just started keeping bees you’re going to be asked by your friends and family, “Do you get stung?” I typically am cordial and say, “Yes, sometimes.” Then in an effort to be a good bee ambassador I go on to minimize the sting and tell them stings to the hands and arms are not so troubling. I also have a tendency to lift up the honey bee by maligning the yellow jacket. If any yellow jackets are reading this I apologize. The true fact of the matter is, I just don’t like being stung! So, just a reminder for everyone to suit up or get yourself a veil for quick chores. Especially new beekeepers may fall victim to the bees’ gentleness during the nectar flow. Yes, they are most typically gentle during the nectar flow but even then things like queenlessness, an overcast, drizzly day, or entry early or late in the day may draw unwelcome attention from guards or foragers in the hive. Yes, you may get away with opening them up for changing a feed jar 20 times before one day when you pull that cover and wham! And then the dearth comes. New beekeepers out there need to know that our Midlands area nectar flow will take a sharp turn downward very close to the beginning of June. It doesn’t turn off, but nectar in excess of colony needs will. This happens at a time when colony population is booming as a result of spring growth and times of plenty. What happens is those numerous foragers now become unemployed. Often they will head out in the morning and “clean up” what nectar is available early in the day, then hang out at home afterwards. It’s hot, nectar is becoming scarce, they’re crowded, and ready to guard their honey stores from other colonies also out looking for food. Also, yellow jackets and other pests may be on the increase which makes them more defensive than normal. My point being, that docile, gentle nature you have become used to during the current nectar flow will become more defensive after the nectar flow so let’s get in the habit now of suiting up or wearing a simple veil. Don’t be the test case for when dearth starts in the Midlands. Beard balm is a leave-in conditioner that softens, moisturizes, and helps style your beard. The beeswax in beard balm offers a light to medium hold, but its main job is to seal in moisture. A well-made beard balm will also condition the skin, leaving it soft and moisturized. Beard balm is a thicker, more moisturizing product than beard oil. Safety is always important but summer heat, dearth behavior, harvesting, and other factors make it especially important to talk about it now that dearth has started and the summer heat is upon us. Your suit/jacket/veil: Make sure your jacket and especially your veil is “bee tight.” Holes in your veil, which you may have been ignoring. will be found by the bees this time of year. If you need a new jacket this year, consider one of the newer light weight ventilated jackets to help with the heat. And just a reminder to double check your zippers before opening the hives. Gloves: You may have tried going gloveless during the nectar flow and had success. You may still have success. Don’t throw your old gloves away though. You may find having them handy a good idea for times the bees object to your presence. 1) an old expired plastic card similar to a credit card for scraping stings out. I usually use my fingernail but having a card may come in handy and is actually probably more efficient in removing stingers with minimal injection of venom. 3) Bandaids, tweezers, alcohol wipes. I also have a chemical ice pack in my yard bucket and always a spare bottle of water. You can quickly overheat in the summer while working your bees while wearing multiple layers of clothing and headgear. Last year, when out in the heat of the day, I started wearing one of those bandanas that absorb water (gel). For Christmas my kids found some fancy ones that hold a bit more water. I have not tried the new ones yet but the old ones worked well. A fellow beekeeper showed me a handy trick once when she poured a bottle of water into a cloth diaper and wrapped it around her neck before putting on her jacket. Drinking Water: It’s not enough to have a backup bottle of water. Have multiple bottles of water close by when working your bees on hot days. Take frequent breaks. Hydrate! EpiPen: A company has started selling generic Epipens for $10 through our local box store CVS pharmacy. I am not allergic but at my next doctor’s visit I’ll be asking for a prescription and will keep one with me on bee yard visits. Cell Phone: A few years ago I stumbled when my foot hit a root stob while I was turning with a heavy box. I dislocated my knee and went down. I managed to reduce the dislocation and get back to the house but it made me think, “what if…?” Make sure you take a cell phone with you. It may be the most valuable safety equipment you pack. Also, there’s no harm in telling someone where you’re going before you go out either. Summer in the “famously hot” Midlands of South Carolina can be especially difficult on the beekeeper as well as the bees. Take extra precautions to ensure your safety in the bee yard. A burly bumblebee nose dives into the unfurling gold petals of a California poppy and vanishes. I lean ever closer until I’m a foot away. The bee spirals up and out, bearing pollen on her legs. Off she hums to the next flower, almost bumping into the honeybees plying the summer morning air. The only registered treatment for Nosema disease is no longer commercially available. On April 12, 2018, Medivet Pharmaceuticals Ltd. – a company based out of High River, Alberta – announced that they were closing their doors. And shutting down Medivet means shutting down production of the world’s supply of fumagillin, in the form of their quick-dissolving product, Fumagilin-B. I’d encourage all new beekeepers to maintain a journal. There are commercial beekeeping journals available with hive inspection sheets and other features but any old notebook will do. You will appreciate your journal next year when you’re trying to remember when the nectar flow started, when you first saw white wax, swarm dates, when various plants started blooming, when dearth began, and much more. These events have a direct bearing on your hive management such as making splits, adding boxes, removing reducers, treating for mites and hive beetles, etc. Keeping a journal will make you a better beekeeper, more observant, and increase your enjoyment and knowledge of what’s happening with your bees. Every year we get posts on the local discussion board with pictures saying they froze the comb for X number of days and then placed in in a Tupperware or other container and under the house or some similar dark place only to find the comb destroyed by spring. Last year in bee school a member of the class asked me about this specifically and said if he placed them in the freezer for days and then immediately placed it in lawn trash bags and sealed them completely and absolutely shouldn’t that work? I told him that “in theory” his plan would work but my experience is some eggs will hatch and if conditions are right they will destroy his comb. The thing about beekeeping is there’s always something to do and something to learn. In the Spring the chores and responding to situations can get overwhelming but with our eyes on the approaching end of the nectar flow, we try to maximize the time we have remaining with nature’s help. Now we enter dearth period. For most this is definitely not as appealing as Spring when nature offered up its bounty of nectar to support our efforts. One thing that beekeeping has taught me well is to stay ahead of the needs of the hive. Knowing what comes next is what makes us beekeepers rather than beehavers. The bees themselves are on schedule and living in the now. We must pave the way to make their now a success. So, keywords for summer are: pest control, and food management. Pest Control is all about staying ahead of the problem. Primarily we have varroa, small hive beetles, and wax moths. Varroa is undoubtedly the most deadly and difficult management problem. Deadly because the mites are vectors for deadly viri which will decimate your colony. Difficult largely because 1) they aren’t very visible and 2) you don’t get much of any warning before collapse occurs. I’ve used the analogy of a flu virus going rampant through a college dormitory when talking to others and that seems to be mostly accurate – one day someone has a cough and fever; the next day everyone in the dorm is bedridden with symptoms. Your method of dealing with varroa is a decision you’ll have to make. At a minimum you might simply want to start with a mite count using the sticky board method, sugar shake, alcohol wash, or ether roll and go from there. I know a number of beekeepers who pull their honey off and then proceed to treat using one of the many treatment options. Timing can be key with many treatments as some treatments have temperature restrictions. For South Carolina that may mean waiting too long takes some of the treatment options off the table. Small hive beetles are another summer pest that you will want to get ahead of. These little pests will multiple inside your hive and destroy the food stores of the colony. I have seen them run a colony out of a hive (abscond) due to pest pressure. And I’ve seen colonies fail to progress due to beetles taxing the resources of the colony. I’ve also seen a colony recover and thrive once the beetles are under control. But don’t wait for a situation to develop before getting them under control. Now is the time to use one or more methods to keep them in check: place oil traps, barriers, and / or dry microfiber pads before the situation develops. Get ahead of the problem and there will not be a problem. Wax moths are a management problem. They are opportunists looking for a weakened hive in which to run amuck. The solution is simply to keep your hive strong. Easier said than done you might say. But “strong” doesn’t mean maintaining a six box high hive full of bees. It means managing your hive such that they are strong with the boxes they have. 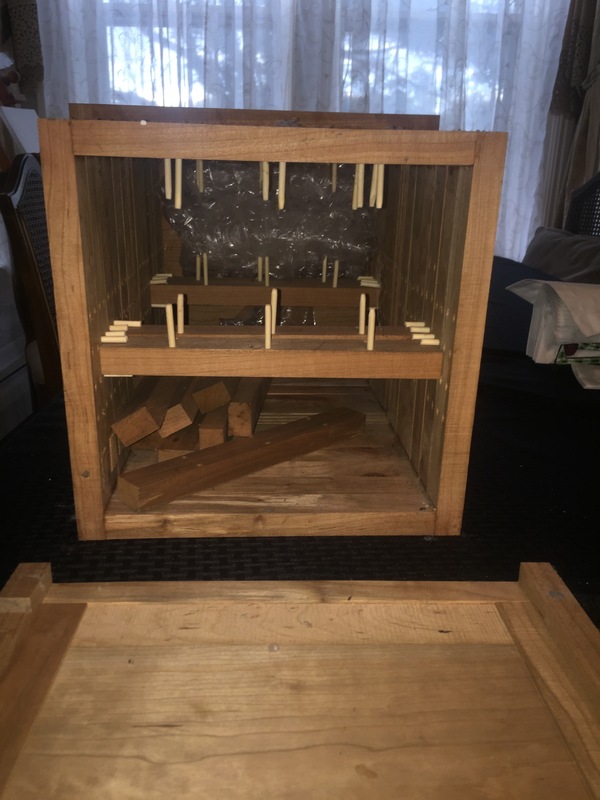 I look at my hives daily and if I see a hive declining in population (maybe no bees at the entrance) I look inside with the idea a box needs to come off. Push your bees into a smaller space such that there are always a few bees standing around the entrance. This is what is meant by keeping a hive “strong enough” to defend itself. Food management: The other big management goal during summer is food management. In class we covered the ideal hive configuration size going into winter as approximately the size of 2 ten frame deeps OR a single ten frame deep + a medium. I have a friend that configures for winter with a ten frame deep and a shallow and he does just fine in our South Carolina winters. Depending on when you acquired your bees this year you may have already satisfied this goal. Some will have more than they need already and they can relax a bit and let the bees consume some of their stores. Others may still need to feed their bees to get to this goal or to encourage more comb building. You’ll have to figure out where you are with your goals and manage accordingly by feeding if needed or pulling some off now for use later in the fall or winter, or otherwise managing the hive so that you begin working through your management techniques, towards the ideal size I mention above. In closing, the above is my opinion based on what I have been taught by my mentors, read, experienced, failed at, and found success with while managing my bees. Your opinions and results may vary from mine. That’s okay. By now all the new beekeepers have watched a bunch of YouTube videos showing people without any personal protective equipment handling swarms, doing hive inspections, and maybe even wearing bee beards. Even while visiting mentor and bee buddy bee yards they have seen gloveless inspections and shorts being worn by more experienced beekeepers while handling their bees. A walk through the bee yard or a quick trip out to deliver a jar of syrup is usually done without formal wear. These sorts of super-human feats of coolness are typically performed during nectar flows. Introducing dearth, a seasonal period when the available nectar is less than colony day-to-day needs. Hungry, irritable bees. Foraging bees with nowhere to ply their trade, jobless and loafing in and around the hive. And I don’t know about you but, like the Snickers commercial, I too am just a bit grumpy when I’m hungry. Act One, Scene One: Older bees with their fully developed venom sacs hanging out at home, irritable and ready to defend their precious stores of honey goodness. For the beekeeper dearth means you too must make changes in the manner in which you conduct yourself around the bees. 1) Wear your protective equipment. Once the nectar flow ends I begin wearing my veil even if just walking though the bee yard or exchanging a jar feeder. You may have 1,000,000 honey bees out there but it only takes one bee having a bad day. A sting between the eyes can turn your pleasant evening stroll into a evening on the couch with an ice pack coupled with periodic and annoying questions from family members. 2) Work your bees during mid-day when the foragers are out of the hive. Depending on the size of the hive, the number of ill tempered foragers not in your way makes a big difference. A hive filled with mild mannered nurse bees is a pleasure compared to cranky guards and foragers. Also, avoid working on days that keep the bees from flying like rainy or windy days. I have noticed that if we get a mid-day rain shower the foragers will return and, during dearth, many will stay home even if the sun comes back out – learned that the hard way. 3) When going into the hive suit up, use smoke, move slowly, and get out when they tell you – when you hear them increasing their “roar.” Your time inside may be limited so work efficiently. Don’t feel you “must” look at everything regardless of them being annoyed. If you’re showing a friend your bees and yammering away then go briefly into a few hives rather than keep one open too long. 4) Start to look at how your body mechanics affect the bees while working them. Are you frequently moving your hands across the top of the frames as you break apart the frames. Instead, use your right hand to break the entire line of bars along the right side then do the left side (with your left hand preferably). Pull the frames closest to you first so you don’t reach across any more than needed. Don’t stand in front of the hive. If possible, try working from the side of the hive instead of the back and you won’t be reaching across them as much. If you have multiple boxes and you “must” inspect to the bottom take the tower of boxes off first and inspect from the bottom, adding one box back at a time rather that stirring them up in each box as you work downward. And finally, if you have to shake bees off the inner cover, out of a box, or elsewhere, save that until last – no need to stir them up while you still have work remaining. 5) When all else fails walk away. You may even have to walk away, wait a few minutes and return to close them up. And if you do get stung, after you take care of yourself, take a picture. We’d like to welcome you to the club! “The Witch, No. 3” circa 1892 Feb. 29. by Baker, Joseph E., ca. 1837-1914, artist. I’m calling journalistic foul on the spate of recent articles I have seen placing the honey bees at odds with native bees. I had to laugh as, for the most part, feral honey bees have already been decimated due to the Varroa mite. If reducing feral honey bees was a solution then it should have been offered as a solution 30 or 40 years ago when we actually had populations of ferals. I’m involved in a local study of feral honey bees and I can tell you that, even in the countryside of the largely undeveloped rural areas we are studying, even finding feral honeybees is a challenge. I believe the truth of the matter is these authors aren’t looking for a solution but rather 1) a step towards a general acceptance that non-native honey bees are to blame and perhaps 2) an angle to obtain research funding using the honey bee as “a problem” to be studied. Or perhaps it’s just a quick fix and human nature to point the finger at someone or something for every issue nowadays. I say Hogwash. Do I think we can overpopulate areas with honey bees? Well, yes in some instances honeybees are overwintered and at other times placed in stock yards awaiting pollination contracts. But I can also offer an instance not considered by the native bee enthusiasts. An instance probably a thousand fold more frequently encountered. I have lived on poor, sandy land for the past 16 years. When I moved here the foliage was scant. So scant in fact that even insects and wildlife were equally scant. After introducing honey bees I have visibly seen an increase in both quantity of nectar producing plants as well as an increase in native bees. How? Keeping honey bees has greatly increased the pollination of the local nectar producing plants which in turn has increased their seed production and reproduction. Now, the area foraged on my the bees has become much more attractive and productive to all species of bees. It is not uncommon for me to now see dozens of flowering plant species in the nearby fields that were not present or minimally present even 5 years ago. And nowadays there are many more native bees on flowers during the day when the honey bees are home bearding on the hive or working a brief nectar flow on a flowering tree. My take on this is that as humans we simply find it of some psychological benefit to play the blame game in this matter – someone or something must be at fault. And Apis Mellifera, that newcomer, non-native must be at fault. Yes, forage is at a premium these days and yes, all bees need forage. But I’m not buying the implication that the decline of native bees is largely to be blamed on honey bees. Apis mellifera mellifera was introduced to North America in 1622 – that’s 396 years ago. Since 1622, many changes to our environmental landscape have occurred, largely due to man. But now, apparently ignoring history but with an overabundance of historical shortsightedness, some journalists are misreading the scientific studies and placing the blame of a lack of forage on honey bees? There is a lengthy list of reasons we have gotten us to our current state of affairs with regard to habitat and lack of forage. Journalists need to look a little more to the obvious if the intent is to truly find solutions to native bee declines. It’s that time of the year again when we get lots of calls to remove flying insects that are actually yellowjackets or wasps, and not honeybees. Whenever a new queen is introduced to the existing colony there is always a chance your worker bees will not accept her, and the result of this could be the death of your new queen – no matter which method of introduction you use. The main things you need to be sure of when introducing a new queen, whether it be into a full colony or nucleus, is that you do not have a virgin queen or indeed a mated queen that has simply gone off lay in your colony. You need to ensure you have removed all queen cells or queen cups, shake the bees off the frames if necessary to find the queen cells they hide in the edges of the frames. Also ensure you do not have laying workers in your hive. In blender combine all ingredients except mint. Blend about 30 seconds until smooth and creamy. Serve immediately in tall chilled glasses. Garnish with mint sprigs if desired. Makes four servings. It’s no mystery that Varroa mites are the single most problem facing honey bees and leading to large percentages of colony deaths a year. Understanding Varroa Risk. We either understand the enemy or he defeats us. The good news is, once understood I can understand the mite’s weaknesses and vulnerabilities. Conquering the mites means I can enjoy my bees much like generations of beekeepers before me enjoyed their bees. In addition, my bees perform better, make more honey, make more bees, and I don’t have the number of odd, random incidents occur in the apiary. All this results when we perform one management task – Varroa assessment, management, and control. View the video below by Meghan Milbrath at Michigan State University for an excellent review of understanding the Varroa risks and assessing Varroa in your colonies. Robert Evans Snodgrass (R.E. Snodgrass) (July 5, 1875 – September 4, 1962) was an American entomologist and artist who made important contributions to the fields of arthropod morphology, anatomy, evolution, and metamorphosis. The first entomological observation which Dr. Snodgrass recalls is seeing that the legs of grasshoppers, cut off by his father’s lawnmower, could still kick while lying on the pavement. This apparently mysterious fact made a strong impression on him, and he decided that sometime he would look into the matter. In 1883, he and the his family moved to Wetmore, Kansas, where his father worked in a local bank, and young Snodgrass began work as a self-taught taxidermist. He had a particular interest in birds, even expressing a desire to become an ornithologist, though his family only allowed limited shooting of birds for his mounted collections. At age 15, the family again moved, this time to Ontario, California, where they settled on a 20-acre (81,000 m2) ranch and grew oranges, prunes, and grapes. It was here that Snodgrass entered a Methodist preparatory school at the high school level, then known as Chaffey College. He studied Latin, Greek, French, German, physics, chemistry, and drawing, but notably no biology because the curriculum forbade involving the teaching of evolution. Snodgrass bypassed this problem by reading Darwin, Huxley, and Spencer in his free time. His openly professed belief in evolution caused him problems in his relationships at home, and eventually resulted in being expelled from church activities in his community. In 1895, at the age of 20, Snodgrass entered Stanford University and majored in zoology, taking classes such as general zoology, embryology, entomology with Dr. Vernon Lyman Kellogg, ichthyology with then Stanford president Dr. David Starr Jordan, and comparative vertebrate anatomy. His first opportunity to conduct research came from Dr. Kellogg, who set him to work on the biting lice (Mallophaga). The excitement of research, and the prospect for publishing original work led to his giving up the desire to become an ornithologist, and the publication of his first two science articles (works 1, 2). During this time, Snodgrass also participated in his first two field expeditions, the first to the Pribilof Islands led by Dr. Jordan, and the second to the Galapagos Islands, led by Edmund Heller. Snodgrass eventually published seven papers with Heller regarding organisms collected during the Galapagos expedition (works 3, 5, 6, 7, 12, 16, 19). Snodgrass graduated from Stanford University with his A.B. degree in Zoology in 1901. He was awarded the 1961 Leidy Award from the Academy of Natural Sciences of Philadelphia. I used to buy bees, lots and lots of bees; singles from South Carolina, nuclei from Florida and frames of brood from New York. I used to buy queens, lots and lots of queens; queens from Georgia, queens from Texas and queens from California. Every year it was the same. Pick up the pieces of my apiary in the Spring, send a big check to southern queen breeders, split up my best colonies, and hope I made enough of a honey crop to pay the bills. Some years I did, some years I did not. Prior to the middle of the 1800’s, most bee hives in North America and Europe were simple shelters for the bees. Skeps, log gums and box hives were common types of hives in this period. Bees attached their wax combs to the hive’s roof and walls, just like they do in wild hives. Today we refer to these types of hives as fixed-comb hives. Skeps were made from grass straw, and often had sticks inside to provide support for the honey combs. Beekeepers inspected skep hives from the bottom. Box hives were simple shelters to house a swarm of bees. François Huber (July 2, 1750 – December 22, 1831) was a Swiss naturalist, born at Geneva, of a family which had already made its mark in the literary and scientific world: his great-aunt, Marie Huber, was known as a voluminous writer on religious and theological subjects, and as the translator and epitomizer of The Spectator (Amsterdam, 3 vols., 1753); and his father Jean Huber (1721–1786), who had served for many years as a soldier, was a prominent member of the coterie at Ferney, distinguishing himself by his Observations sur le vol des oiseaux (Geneva, 1784). Movable comb hives allow beekeepers to start new colonies easily by dividing a hive. They also allow beekeepers to inspect the health of colonies, find the queen, and even cut honey comb without destroying the brood nest. Bees in movable comb colonies were disturbed less than bees in fixed-comb hives, so beekeepers received fewer stings! Many movable comb hive inventions used “frames” for the bees to build their combs inside. Huber’s leaf hive. The Leaf Hive, invented in Switzerland in 1789 by Francis Huber, was a fully movable frame hive. The combs in this hive were examined like pages in a book. A.I. Root and E.R. Root credit Huber with inventing the first movable frame hive. – L.L. Langstroth in Langstroth on the Honey-Bee, 1860. The leaf or book hive consists of twelve vertical frames or boxes, parallel to each other, and joined together. The cross spars, nine or ten. The thickness of these spars an inch (2.5 cm), and their breadth fifteen lines (1 line=1/12th in. 15 lines=1 1/4 in.=32mm). It is necessary that this last measure should be accurate; a piece of comb which guides the bees in their work; d. a movable slider supporting the lower part; b b. pegs to keep the comb properly in the frame or box; four are in the opposite side; e e. pegs in the sides under the movable slider to support it. A book hive, consisting of twelve frames. 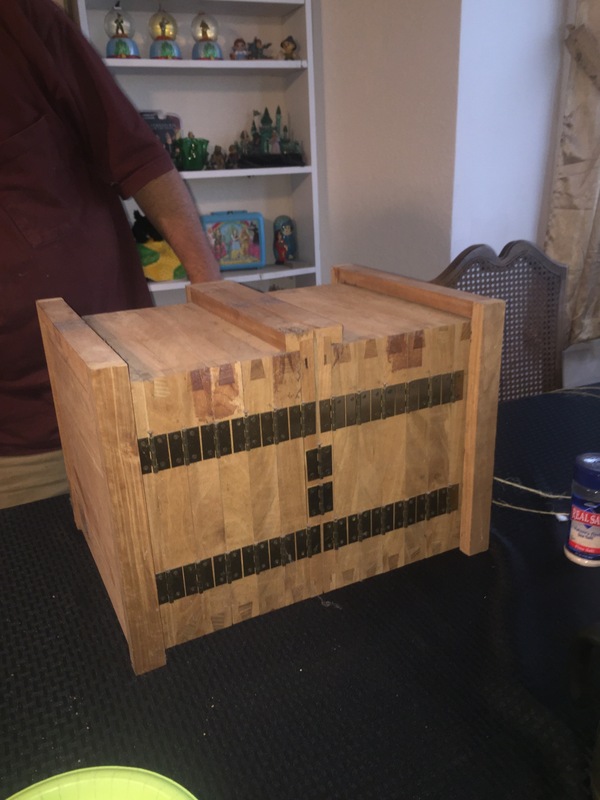 Between 6 and 7 are two cases with lids, that divide the hive into two equal parts, and should only be used to separate the bees for forming an artificial swarm; a, two frames which shut up the two sides of the hive, have sliders. The entrance appears at the bottom of each frame. All should be close but 1 and 12. However it is necessary that they should open at pleasure.